A tech firm in Japan recently introduced a technology that would make 3D images a little more tangible. Thanks to the use of haptic technology, which is used in everyday objects such as video game controllers and smartphones to create vibrations simulating real-world touch-based interactions, Miraisens has created touchable 3D technology. 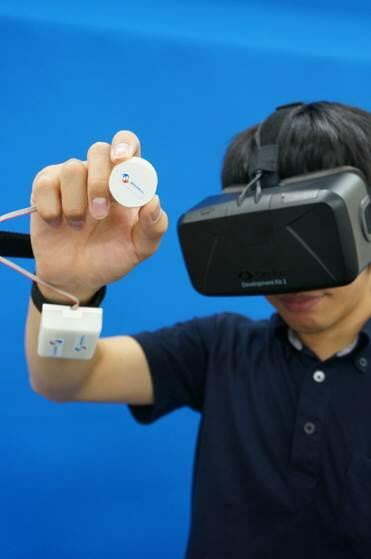 The “3D-Haptics Technology” uses a virtual-reality headset and wrist-mounted box connected to a fingertip-attached molding, coin-shaped molding, stick or pen. This setup allows a user to “feel” virtual objects – the resistance of a button, for example. “This technology will give you a sense that you can touch objects in the 3D world,” according to Natsuo Koda, chief executive of Miraisens. There are a number of possible applications for this touchable 3D technology, ranging from the casual (e.g., enhancing the realistic nature of video games and virtual musical instruments), to the artistic (e.g., replacing a mouse or tablet with natural gestures when creating 3D-printed objects), to the mechanical (e.g., remote controlling robots and feedback-based driving). Miraisens wants to commercialize the technology via the electronics and services industries. A software development kit (SDK) and a content development kit are being prepared by the company with the hopes of launching a closed beta at the end of the year and an open beta in spring 2015. The company will hold a technical workshop in the U.S. in November.